My dear hubby loves cabbage rolls. I can not eat cabbage, so I don't make it for him as often as he would like. When I came across this recipe over at Homemade Happiness I knew I'd have to give it a try! The results? Wonderful! I made it just as the recipe states (ok I cut it in half since we are empty nesters now! ), and think based on our own health and taste preferences will tweak it just a bit next time. 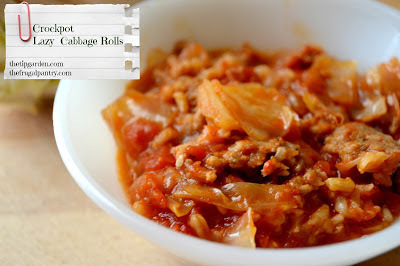 The originial recipe I am posting here has that wonderful traditional cabbage roll taste and does not need changing. My husband is diabetic and the tomato soup and ketchup had a bit to much sugar for him, so next time I'll substitute out my own homemade marinara sauce,but othewise we loved it! (Ok, I might also do half ground beef, half ground sausage next time). Brown ground beef in a non-stick pan, drain any fat and season with salt and pepper. Place half of the cabbage on the bottom of your crock pot. Add the cooked ground beef on top. In a bowl, mix together remaining ingredients and pour over top of rice. Add remaining cabbage on top, place the lid on, turn on high for 3 hours or on low for 5 hours. Mix all the layers together by giving it a good stir and you are ready to eat!